Former Republican President Rupiah Banda has urged Zambians to protect the image of the country by not issuing reckless statements which can impact on the country’s economy. Mr. Banda said Zambians should be patriotic and protect the integrity of the country. He said it was embarrassing to see how some Zambians had resorted to denting their own country’s image by issuing reckless statements. The former Head of State said he was becoming fatigued of responding to questions about the purported sale of the airport and ZESCO by people outside Zambia. He said some Zambians had gone on a campaign to lie that government had mortgaged its state owned enterprise when in fact not. And the Former President has called for peace in the on-going political campaigns in Sesheke. Mr. Banda has urged political players to maintain peace and resolve their differences through the ballot. He further urged the youth to desist from being used as tools of violence. Mr Banda is in Addis Ababa, Ethiopia to chair the Eminent Panel meeting of Eastern and Southern African Trade and Development Bank. Meanwhile, President Edgar Lungu has arrived safely in Addis Ababa, Ethiopia. He travelled from Harry Mwaanga International Airport in Livingstone to Bole International Airport in Addis Ababa. 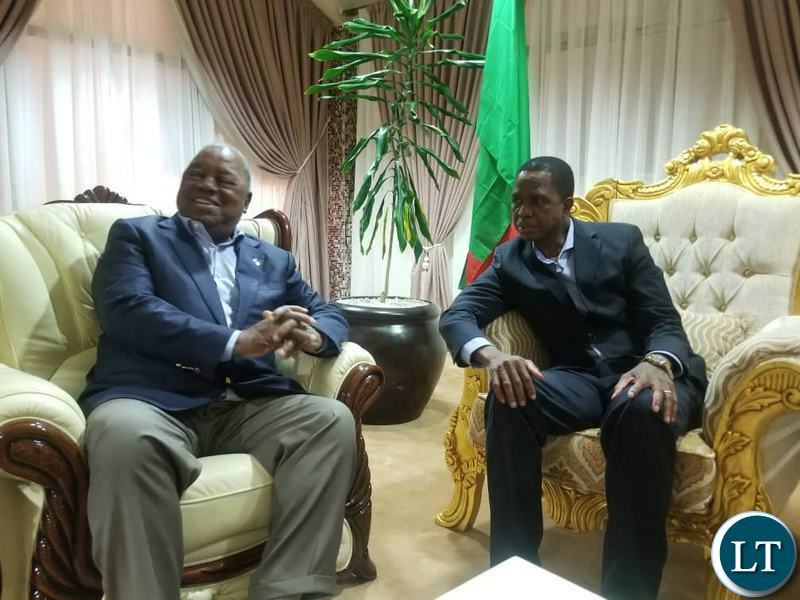 President Lungu also met Zambia’s 4th President Rupiah Bwezani Banda who arrived from south Africa. President Lungu is expected to attend the 32nd African Union Ordinary Session of Heads of State and Government Summit. President Lungu is also expected to hold various bilateral meetings including with United Nations Secretary General,Antonio Guterres and others. It was reported RB lead observer team to Nigeria how come today he meets Lungu in Adisaba, Ethiopia? What is RB’s mission to Ethiopia? Of the two above I like and respect more the one on my right. The one on right : He is married to a mature woman, unfortunately she tries too much to be a queen, and to be called a mother of Zambia. We don’t even know if she is mother of Tasila. But I hear there are older sons in their mysterious marriage, I respect that we don’t see them, they might be disciplined. His sons were worse than current dubious PF ministers. The sons of RB are bad news !! The he force some young (not so pretty) woman into marriage. Ka NaMpundu is humble, she did travel too much or get involved in ministers affairs like Fire Trucks. Maybe they should swap wives for real. Think about it! Zambia is a GREAT country, best country in Africa. Ba Banda Bwezani Ndalama, if any person asks a question, just say NO COMMENT. You won’t lose anything. The denting Zambia’s image are the ones that take a 25 member delegation to go and receive a donation of obsolete fire engines . It’s embarrassing to see an old man with white hair without wisdom, losing his morals just bcoz he wants to continue eating, globe-trotting on Govt expense. After 2021, we’ll see if you’ll still have access to Govt funds. Ha rp lelo you can say that because you eating with Lungu. When Sata was alive he put you into the gullows and you were the first to scream to the international community about how PF was persecuting you. Any way we shall see if your words will still be true another rdgime takes over. You thief RB please shut up if you have nothing to say. Please stop patronising us ! Sounds like RB will be the one standing in 2021 as a joint PF and MMD candidate. Therefore he is kicking off the campaign. That said, he is spot on. We have people demeaning Zambia as failed state, which no where near the truth. Especially Double H. Double H is a liar and saddist. Talk about the violence, you *****. 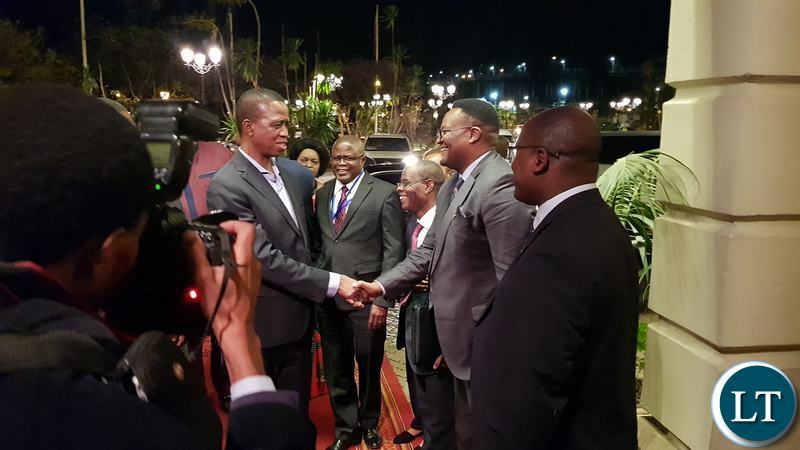 Where does HH come in Lungu and RB Banda meeting in Ethiopia. These two have dented Zambia’s image outside as a corrupt and violent country. They are in Ethiopia while violence goes on in Sesheke. Kikikikiki give us space who sold Zamtel to Lapgreen? Zambians ain’t denting the country’s image, Lungu did it himself. Zambians didn’t invent the high debts ,the IMF downgrades and the many shady deal$. Our memories are still fresh, remember this; A video in which UPND Kalulushi Candidate Evaristo Mwalilino’s driver revealed how Hakainde Hichilema and Geoffrey Bwalya Mwamba’s Kalulushi Constituency votes where concealed went viral after it was aired on Prime TV. We all know a person who paints Zambia black on daily basis and it is evil HH!!! Nobody knows Kainde’s father because he is not Zambian,hence his evil behaviour about our country week in,week out.However,do not worry bwana RB,majority voters from 6.5 provinces shall continue rejecting HH in 2021 as they have been doing since 2006!! !Kainde is very bitter today due to his several electoral defeats he has suffered since 2006.WE CANT WAIT TO SEE HH CRY ONCE MORE AFTER LOSING ELECTIONS IN 2021!!! Ndelombako ubwafwilisho/ Nipempako thandizo mentality has not spared state hauzi. Zambians can longer be f00ed by the likes of you @njimbu the dimwit kandilemo. Even children can see through PF thugs lies like you and your drunkard President Lungu. You are not even ashamed that your government minister was raided by police not long ago for embezzlement and grand corruption and yet you f00l continue to accuse an innocent person . You lot deserve to be jailed now for killing millions. Please you can surely do better than this! Why is RB scared of hearing the truth . The President for the sky is absolutely useless and dodges responsibility .He has abandoned the running of the country to That Amos I know it all Chanda . RB has no leadership skills he never wanted to give up power. An old foolish grandfather, and had he not given up power ba Lungu would not be president today. How they embrace him and how they make him look like a hero is so sad but this is Zambia anything is possible. You are so right President RB. many years ago, Nigeria had a very bad image of being a corrupt nation ( and it may still be so), BUT TODAY you will never hear a Nigerian disparaging his country. On the contrary, at every turn they go out of their way to dispel any such notion at the instant it arises. same goes with Rwanda and the genocide. But for Zambia, it’s quite the opposite. As if on cue from His Haughtiness himself, they all want to outdo each other in ever descending degrees of insanity. Really shameful. You have no Nigerian friends or associations. Best not to claim what you cannot support. You know nothing and so shut your gab! I live with Nigers and they show me things happening in Nigera from their news outlets every day. Nigers now build homes to keep billions of embezzled money if you don’t know. They have stopped using offshore accounts like your stupid Lungu and his stooges. That’s why in Nigeria today there is no shortage of forex. Please next time you open you gab speak from the point of knowledge not ignorance. This is not true, I’m married to a Nigerian man and I have been to Nigeria a lot of times. They do that everyday. Just watch their movies! We speak and gets blown away by the wind. They speak and create records. @ Wanzelu, your gob is dribbling gab. Cool it. Your excellency Banda, you are invited to meet in Ethiopia with the president and now your voice is heard. Where is your voice on the killing of an innocent student and all the bad things happening in zambia? where is your voice on the on going events in Shesheke? shame on you sir that you stoop so low as to grocel when as an ex stateman you should be the voice heard loudest in our country condemning the violence by the PF force. RB has been invited to chair. Some of you cannot even be invited to attend the family gathering. Please note that there is no rule ever enacted in the Zambian parliament that says no two leaders can be in the same district at the same time campaigning. It is a lie. To restrict one from being in Sesheke because another one is there is complete deceit. They can be in the same district and those with the mandate to check orderliness must do their job. Government and Police must not create rules that don’t exist please. straight forward issue. You absolutely right on that one. Why politicians waste so much money on unnecessary useless trips when the majority is languishing in poverty? Do not see any benefit of such trips to Zambia. AU is a toothless, visionless clueless outfit. You should also stop abusing tax payers money, you guys don’t care about the people . The only people denting the image of Zambia are the two biggest thieves that have walked the Zambian soil. Lungu and RB. They have damaged Zambia because of poverty and stealing resources. Two most dangerous white collar criminals. Who would have though Lungus corrupt government (Chitotela is still a Minister) would make Bwezani look like a saint. Rupiah was corrupt but he had a vision for Zambia, Lungu hasnt a clue where he is going.